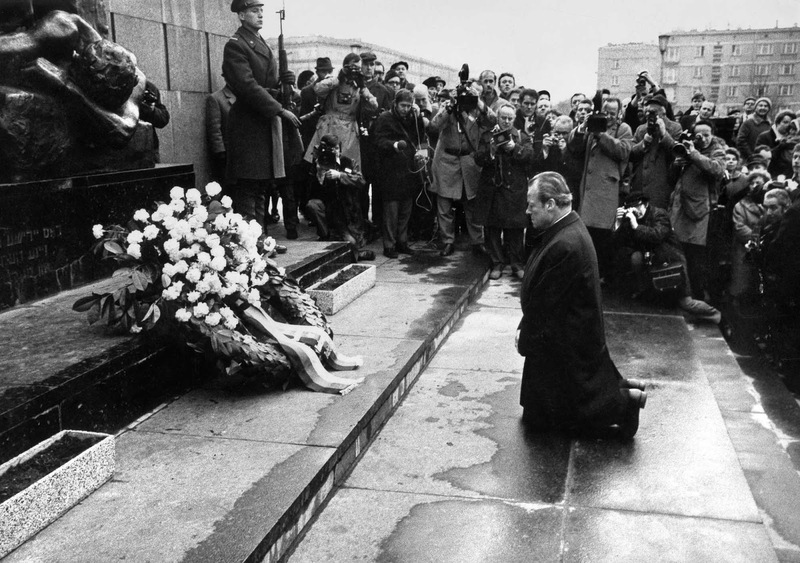 Kniefall von Warschau (German for “Warsaw Genuflection”) refers to a gesture of humility and penance by German Chancellor Willy Brandt towards the victims of the Warsaw Ghetto Uprising. Those who witnessed the scene were awe-struck: a politician actually displayed his emotions by confessing to guilt and begging for forgiveness. With his head bowed low, he froze in this position for twenty or thirty seconds. “I have been often asked what the gesture was all about. Was it planned? No, it wasn’t”. This is how Willy Brandt described the situation many years later in his memoirs: “As I stood on the edge of the Germany’s historical abyss, feeling the burden of millions of murders, I did what people do when words fail”. The event took place on December 7, 1970, in what was then the Communist People’s Republic of Poland during a visit to a monument to the Nazi-era Warsaw Ghetto Uprising. After laying down a wreath, Brandt, very surprisingly, and to all appearances spontaneously, knelt. He remained silently in that position for a short time, surrounded by a large group of dignitaries and press photographers. On the same day, Brandt signed the Treaty of Warsaw, which acknowledged the Oder-Neisse-Line as the final German border with Poland. Both actions attracted controversy within Germany, as did Ostpolitik in general, favored only by a narrow majority in public opinion. It was disputed within his own party, whose voters had included a significant proportion of expellees from the formerly German territories in Poland, most whom then went to the conservative parties. In historical terms, Brandt gained much renown for this act, and it is thought to be one of the reasons he received the Nobel Peace Prize in 1971. According to a Der Spiegel survey of the time, 48% of all West Germans thought the “Kniefall” was excessive, 41% said it was appropriate and 11% had no opinion. The Kniefall was a symbolic action the opposition tried to use against Brandt, as in a Constructive Vote of No Confidence in April 1972, which Brandt won by only two votes. Brandt’s landslide win in the next elections in late 1972 was also due to the growing view among voters that Brandt’s Ostpolitik—symbolized by the Kniefall—and his reformist domestic policies were helping to boost Germany’s international reputation and should be supported. 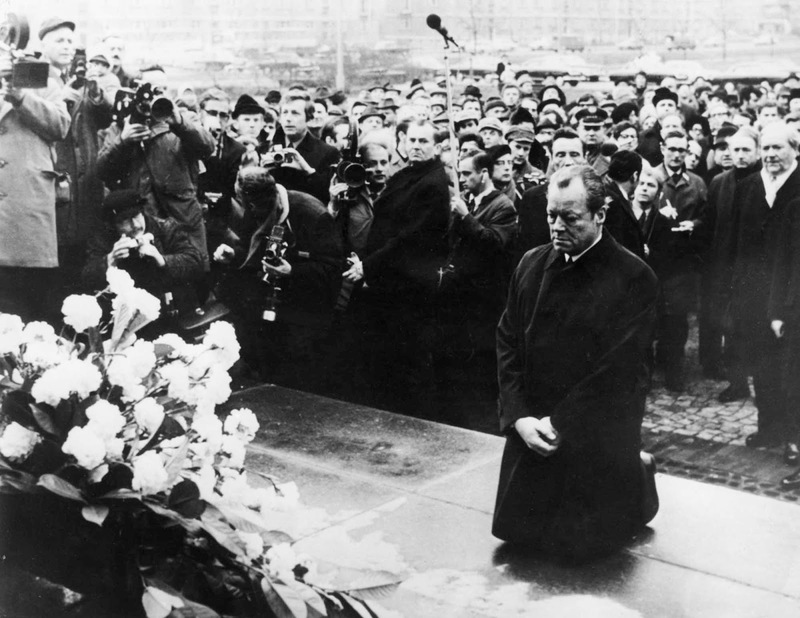 A monument to Willy Brandt was unveiled on 6 December 2000, in Willy Brandt Square in Warsaw (near the Warsaw Ghetto Heroes Monument) on the eve of the 30th anniversary of his famous gesture. It is a real shame that this photo of Willy was not in Colour. A very inspiring story accompanied by a very powerful photo This has truly renewed my faith in humankind for this humility is really the roots of mankind without it we are nothing more than animals. So nice to hear Brandt was awarded the Nobel Peace Prize in 1971.